Mahogany Irish Secretaire Bookcase, with green silk doors, circa 1790. 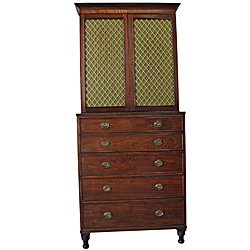 This mahogany secretaire bookcase retained its original finish of sealing oil and wax. It had faded and was largely abraded to bare timber. The bookcase had large splits to the back boards, broken sections of moulding and was missing the brass grills and silk inserts to the upper doors. Two of the original drawer pulls had broken away from their plates, but the original escutcheons were all intact. Treatment to the bookcase included consolidating the splits to the back boards, creating and replacing missing timber sections of moulding, making new brass grills and pleated silk curtains based on designs from the period, and patinating the brass fretwork to match existing hardware. The tarnished drawer pulls were carefully cleaned and broken sections re-placed. The original finish was revived by carefully cleaning and waxing.